With lots and lots of promotional drinkware for sale out there today, the endless choices can sometimes be more of a “curse” than a blessing! Which one to go with? Which one will make the most sense for your upcoming marketing event or party? Well, one big consideration as you make this very important decision to to look at your budget. 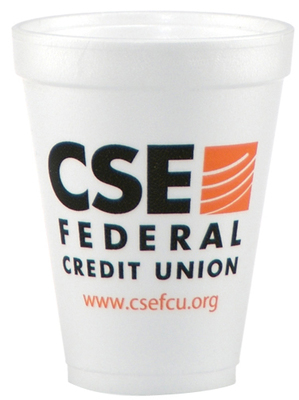 If you are on a tight budget, the most economical custom disposal cups would definitely be the custom styrofoam cups – it will not break the bank and you will stretch your dollar and get your logo, or design, or text message clearly across to your client base. Personalized styrofoam cups are super lightweight and easily disposable. Clean-ups after every event or party becomes a much lighter chore if there is not a huge amount of dishes and drinkware to clean up. At Promotion Choice, all of our custom styrofoam cups are domestically made and are quality Dart brand cups. As mentioned above, they are lightweight yet durable, and even though they are promotional disposal cups, they can withstand re-use over and over again at any event without leaks or breakages (barring clients deliberately crushing the cups!). All personalized styrofoam cups also have nice white backgrounds, so your company logo will always stand out clearly and if pantone color matching is never a problem or issue here since the cups are white anyways. Pantone color matching always becomes an issue when printing on any other colored cups other than white. Another advantage of using personalized foam cups for parties and events is that foam is naturally a great insulator – this means your cold beverages stay cold or cool and your hot or warm beverages stay that way for longer as opposed to cups made from other materials. When using printed logo foam cups for your events, you can also serve very hot beverages without any worries about your clients or attendees getting scalded due to its great insulating quality. This means that you get to save even more money by not having to purchase coffee sleeves to go along with your cups, which is not just an additional cost, but will cover up your company logo or brand message, and completely defeats the purpose of the imprinted logo foam cups. We believe in offering lots of choices for our customers, and on our Custom Styrofoam Cups page, we offer eleven different sizes of promotional foam cups – ranging from small sample of tasting cup sizes like 4 or 6 ounces to a whopping 44 oz and everything in between. Check out the picture of our branded foam cup sizes to see what's in our inventory. We also sell lids separately, which include translucent straw lids – used mostly for cold beverages, and of course the flat lift lock lids or the dome sip-through lids for hot beverages like coffee or tea. These lids are available for most of our foam cup sizes, particularly our most popular sizes like the 8oz, 12oz, and 16oz customized styrofoam cups. The only minor drawback with ordering wholesale styrofoam cups in bulk is that shipping for these cups are calculated by Fedex or UPS based on carton dimensions. So while the cups weigh practically nothing, logo foam cups in wholesale bulk orders can have slightly more expensive shipping costs due to the large dimensions of the boxes they are shipped in. However, the low costs of the cups themselves especially when ordering in large quantities, more than offsets any slight increase in shipping costs, so there is definitely no worries there. And here at Promotion Choice, we always do everything we can to help you save and make the most of your budget – our print foam cups have one of the lowest prices online, and on top of that, due to our shipping volume, our shipping costs are also highly discounted, and we pass those savings on to our customers!